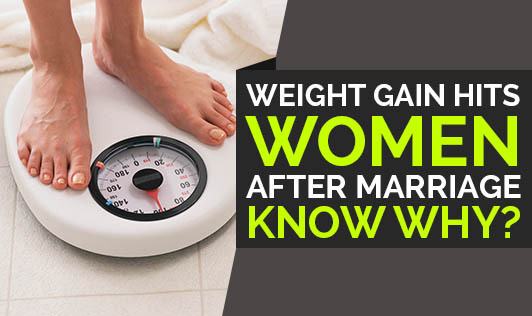 Weight Gain Hits Women After Marriage- Know Why? Many of you make conscious efforts to maintain the best shape of your lives before marriage through various activities like exercise, sports, gymming , household etc. But it surprisingly, becomes helpless after marriage to battle with the weight gain issues. When you are single, you probably take more care of yourself to look younger and healthier. Once you gain a spouse, you gain with it the waistline and other responsibilities and the priority drops automatically. Firstly, pregnant women tend to overeat during this period and become inactive, also they believe that they need to eat a lot more than they actually do and they need to slow down and relax more than they do. Secondly, pregnant women crave for less healthy foods, which compound to the problem. Diet goes hayway when you wish to spend time with spouse and family by choosing to eat out more than at home due to time factor. You tend to go with the foods that your husband or children like, rather than eating what you prefer. Many of you end up eating foods that are left out at the end of the day, thinking it will go a waste. This can add to the extra calories over a period of time, causing weight gain. There are always myriad of unresolved issues after marriage like unconditional love, stress, insecurity, feeling disrespected, rejected etc. Research has shown that few of the above factors can lead to weight gain than the happily married counterparts. This is absolutely a silly excuse to the weight gain. Many women bring in the reasons like rearing the children, managing the family etc thereby no time to look after themselves. These in a long run have an impact on the weight and lifestyle diseases. Those who are overweight, find a way to get out of the excuses and begin a proper healthy diet and exercise routine. You will be glad you did!